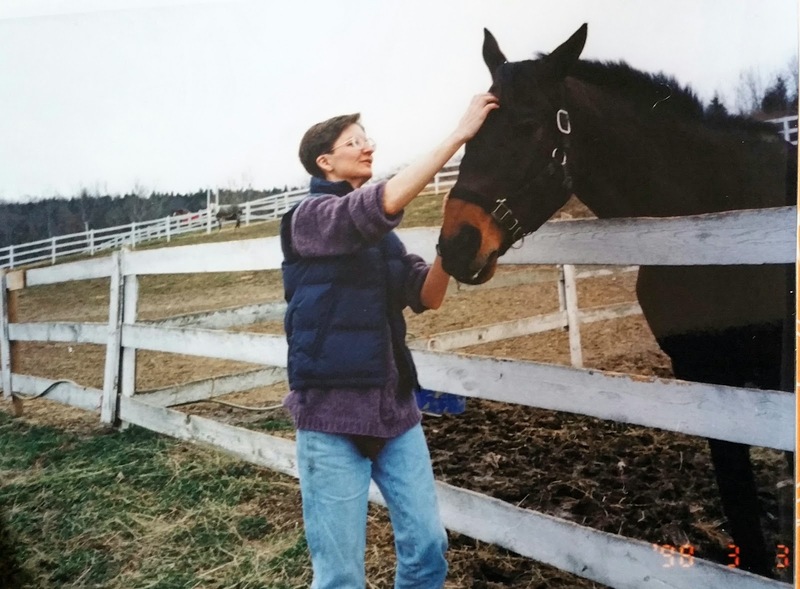 Harv at Saddle Valley Farm in 1998, day one in the quarantine pasture. I have joked with friends that I've been predicting, and dreading, Harv's demise since he turned 16. Probably around 2003, a fellow boarder kindly and firmly gave me a reality check when I tearfully told her about my fears of losing "my aging boy." I know now, sixteen is YOUNG for an otherwise healthy horse. So... I'd been dreading losing Harv for a long time, and wondering how it would feel to lose him. Here's the honest truth. He doesn't feel gone. He has been so constant in my thoughts, in my heart, for years -- even though I'd love to see him "for real" he is not exactly absent either. So now, it's like he is still here, as he's always been. Even when I went back to the barn where I boarded him, I wondered how it would feel to see the empty stall. I braced myself. But when I went into the barn, and saw his stall, it was like he was still there -- I could feel presence. It didn't hurt that his stall had fresh shavings, like it was waiting for him. Christmas was tough. Bob and I always went out to take our christmas photo with Harv -- and this year, I missed this tradition. It didn't feel right to do photos with Riley. People lose horses is horrible, sad, tragic ways all the time, and my heart goes out to them. I have been lucky, to have had Harv so long, and to have enjoyed him so fully, and to have had a goodbye that was sad, but not horrific. I'm so behind on blogs I didn't even know he was gone. I'm so, so sorry for your loss. I'm thankful that it was a peaceful goodbye and I'm glad you can think of him with happy memories. Hugs! Awwww, know this feeling too well. Harv is likely up there with my Max, getting great advice on how to outwit a human (for his next life)! Sorry, could only post anonny for some reason, but I am April Reeves.